A couple weeks ago, Ubisoft acquired Blue Mammoth Games and in the process, ended up having a new fighting game in their library with Brawlhalla. The free-to-play game apparently had a few things in the works during the process and now, very unexpectedly, we’re getting to see Shovel Knight in the game. The game’s website made a quick blog post about it but gave no details as to when they were coming. Regardless, it’s cool to see these characters come to the series! We are thrilled to reveal that not only Shovel Knight but some of his compatriots will be coming to Brawlhalla! 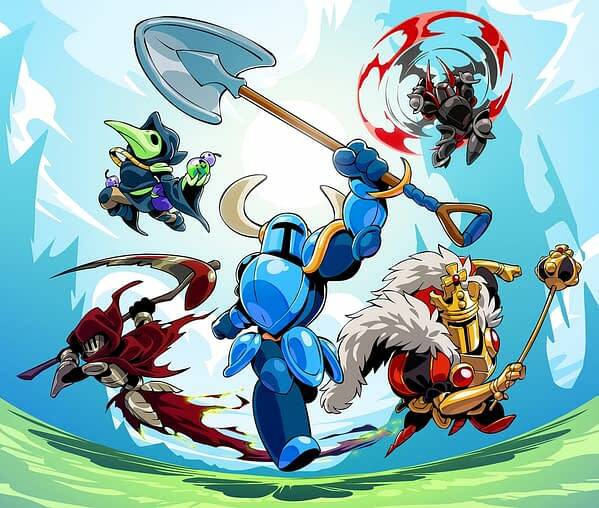 In addition to Shovel Knight we’ll be adding King Knight, Black Knight, Plague Knight and Specter Knight. For the first time ever, these skins will come with unique select animations and signature effects! Keep an eye out for more information as we get closer to the release!